Our next step in redecorating Patrick’s room is to look for bedding and fabric. He is a typical guy who really doesn’t like to shop, but it’s his room, so I insisted he choose the chair and bedspread. I know I won’t have time to make a bedspread, but I can manage valances for the window and a bedskirt. We headed for the bedding section at the local department store. Red is just not a hot color now, so our choices were limited. I pulled out 5 bedspreads that would go with his chair: denim, a black/red bold stripe, a navy matelasse, a grey/red hip and trendy print and black graphic print. He chose (drum roll, please…) the navy matelasse! 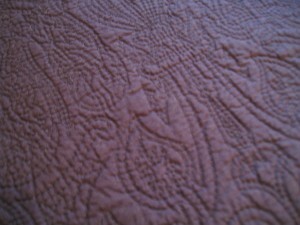 A matelasse is two pieces of fabric that have been quilted together by hand or machine with matching thread. It’s beautiful coverlet, but it doesn’t offer any other colors to use in the room. Next, I went to area fabric stores to look for a coordinating fabrics for the drapery and bedskirt. 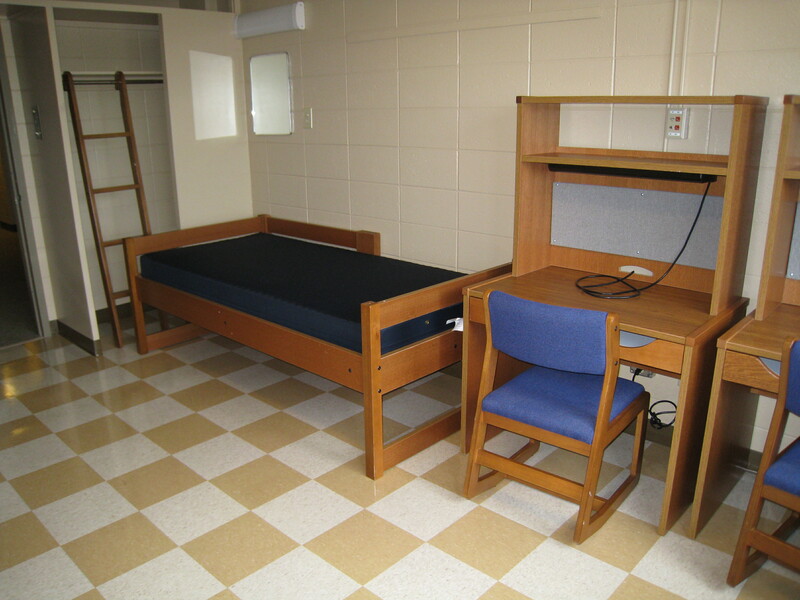 That was a challenge too since we didn’t want a patriotic red, white and blue room. I also didn’t want to show him too many choices. Like most clients, too many options are simply overwhelming. 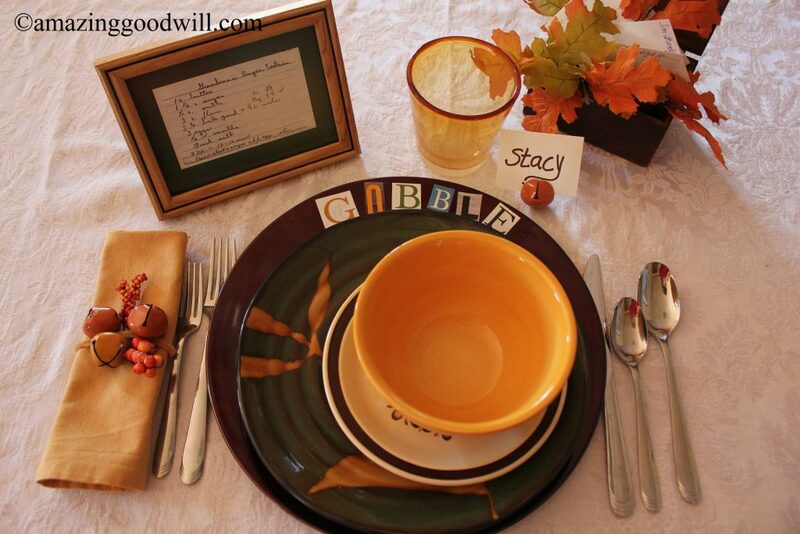 A good designer knows her client and can narrow down the choices before making a presentation. 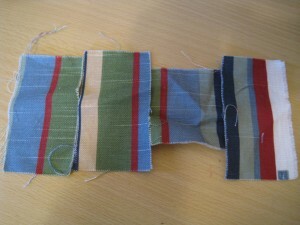 This stripe fabric would have been perfect had it not been sold out! Pat liked the navy, green, red and beige stripe, but it was already sold out by the time I returned. 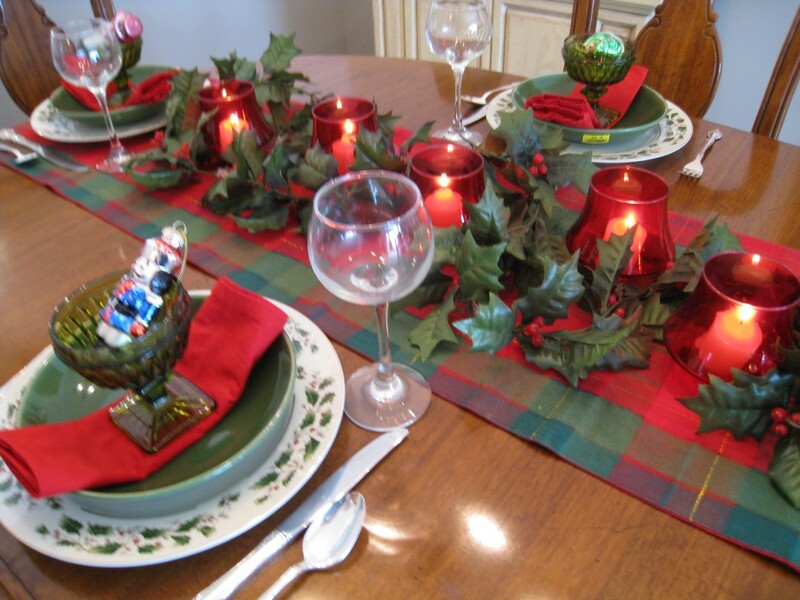 He also liked a solid red quilted fabric and I talked him into a dark, navy, red, green paisley. This paisley fabric is very grown-up and a little sophisticated! The bedspread was regularly priced at $150.00, but on sale and with a coupon, I got it for half price! 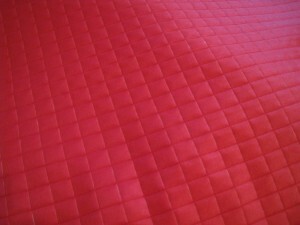 The red quilted fabric was also on sale, marked down from $14.00 a yard to $11.19. Unfortunately, the store had less than 2 1/2 yards. There won’t be enough for the bedskirt, but I can make a simple drapery valance out of the piece. 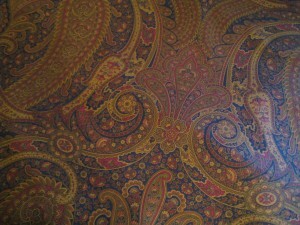 I also had a 50% off coupon for the paisley fabric (see a trend here?). I paid $12.50 a yard instead of $25.00. I bought the end of the bolt so I’m hoping 5 yards of fabric will be sufficient. At least we have some colors to choose from when we pick paint. Fortunately, I have lots of paint chips at my office and we can pick one out before we head out the store again.